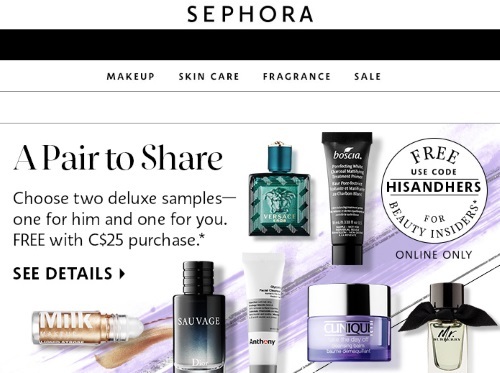 Sephora has a great new Free Sample offer for Father's Day coming up! Choose two deluxe samples, one for him and one for you! Free online with any $25 order. Enter the promo code HISANDHERS at checkout to add this promo to your cart. Dior Sauvage, Burberry Mr.Burberry Eau de Toilette, Versace Eros, Anthony Glycolic Cleanser, Cliniqu Take the day off cleansing balm, Boscia Porefecting White Charcoal Mattifying Treatment Primer and Milk Makeup Liquid Strobe. Offer available while supplies last, for a limited time. Click here to browse our other Sephora posts.